Has Liberty Been Bred Out Of Us? I would like to begin this by asking you a question. Why do you think our Founders chose war against a bigger and much better equipped army rather than the continuation of the status quo that had existed for over 150 years; what was it the led them to risk their lives, their fortunes and their sacred honor? I’ll bet you didn’t know that, upon hearing the shots being fired at Lexington and Concord, Samuel Adams proclaimed, “This is a glorious day for America.” How could the sound of gunfire be a glorious day unless it was being fired in defense of something people were willing to die for? What would YOU be willing to die for? Is it your own life, the life of your family, or possibly the defense of the things you have acquired over the course of your life; your property? Is that it? What good is life if you have no freedom? What good are belongings if you are told when and where you can use them? Our Founders knew that liberty above all else was worth fighting and dying for. If you recall your American History it was Patrick Henry who loudly proclaimed, “Give me liberty or give me death.” Henry knew, as did many of the other Founders; men such as Thomas Jefferson and Samuel Adams, that liberty was something that carried with it a high price; but that if people wished to secure it they must be ready to pay whatever it cost to secure and defend it. I would now like to ask you another question. Does the spirit of liberty beat within your breast; would you be willing to lay down your life to obtain and defend it? I’m not talking about the men and women of the armed forces, or those who enter into the law enforcement profession to uphold our nation’s laws; I’m talking about average citizens who would be willing to stand up the their government when it violated their most basic rights…can you say, without reservation, that you would be among them? I have read that during the period which saw America become an independent country the people living here were divided into 3 categories; roughly consisting of about 1/3 of the people in each. The first category was those who favored independence from England; the second were those who favored a continuation under English rule; and the third category consisted of those who really didn’t care one way or the other. I believe that the three categories still exist in America today, just that the proportions of those within them have changed. I know quite a few people who show little concern for what is happening in this country as it pertains to what their government is doing. For simplicities sake let’s call this group the ignorant and apathetic majority. Then there are those who are active politically; that is they vote and pay a certain amount of attention to what is going on in government; yet their loyalty is to the government itself and not the principles upon which that government was founded. If you were to combine these two categories I believe they would make up somewhere in the vicinity of 90% of the American people; possibly even more. Then there are the rest of us, and I say us because I include myself in this category. We are among those who have taken the time to learn the history of the American Revolution; why it was fought, and we see a repetition of the tyranny of King George III in our existing government today; in fact we believe that the government we live under today is far worse than the one our Founders fought to free themselves from. We are among those who the rest of the country calls the radicals, the extremists, the conspiracy theorists, and all the other insults people hurl in our directions to get people to disregard our message and our warnings. If you have any functioning critical thinking skills left in you, I would ask that you focus them all upon the following quote, “You need only reflect that one of the best ways to get yourself a reputation as a dangerous citizen these days is to go about repeating the very phrases which our founding fathers used in the great struggle for independence.” That alone should tell you that there is something very, very wrong in America today; when the same beliefs held by those who risked their lives to obtain their independence from a tyrant are now considered DANGEROUS. The root of this problem is simple; people simply do not know why their government was created; what purposes it was established to serve. I can say that with certainty because when I discuss politics with most people their arguments always originate from their individual positions along the two party paradigm. Rarely do I encounter people who question whether what their government is doing is constitutional or not; or whether it serves to further the purposes for which their government was established in the first place. And, here, we must guard ourselves against an error, which is too often allowed to creep into the discussions upon this subject. The preamble never can be resorted to, to enlarge the powers confided to the general government, or any of its departments. It cannot confer any power per se; it can never amount, by implication, to an enlargement of any power expressly given. It can never be the legitimate source of any implied power, when otherwise withdrawn from the constitution. Its true office is to expound the nature, and extent, and application of the powers actually conferred by the constitution, and not substantively to create them. Therefore, does it not make sense that in deciding what powers we will allow our government to exercise on our behalf we should look to the Preamble to the Constitution and not what some candidate or political party tells us is the purpose for which our government was established? I placed Wilson’s quote last for a reason, and that reason is because Wilson uses the term members when referring to the natural rights. While you might assume that the word members is in reference to the people who inhabit a country, I tend to believe it refers to those the government was established to represent. Why would those who wrote the Constitution establish a Senate which derived its authority from the States if the States were not an essential part of the government? It seems to me that they did so in order for the States to have a say in what laws were passed by the federal government. When, if I may be so bold to ask, can you recall your State Legislature choosing who will represent YOUR State in the Senate? If you can’t answer that, I’ll do it for you; the last time that happened was a century ago; prior to the ratification of the 17th Amendment. But even then, the States had become mere appendages to the central authority; that having occurred when the federal government told its creators that they must submit for all eternity to its authority or face an army whose sole purpose was to impose the federal authority upon the individual States; i.e. The Civil War. Does it matter why the Southern States chose to secede; be it over slavery, tariffs, or something else altogether? If the people within each State had, as sovereign citizens within their State, granted their consent to be a part of a Union for certain specific purposes, then if the government created by their consent became destructive of the ends for which it was established, was it not their right to withdraw their consent and leave the Union? I’ll bet you weren’t aware that after the Civil War ended Confederate President Jefferson Davis was held in prison for two years without ever facing a jury for the crime of treason against the Union. Why would they not bring him to trial if they had nothing to fear? The reason for that was that if he had been brought to trial the argument of whether a State had the right to secede from a voluntary Union would inevitably have come up, and it was still commonly believed that the States retained that right. Had Davis gone to trial the blame for the Civil War would have been placed squarely upon the victors, and Abraham Lincoln himself; and the government could not allow that to happen. The Civil War was, and remains, not a war to end slavery, but a war to subjugate the States under a strong centralized government; exactly the opposite of what those who ratified the Constitution were promised would happen if they chose to accept this form of government. The ratification of the 17th Amendment was merely the final nail in the coffin for State involvement in the operation of the federal government. If what I say is true, and it is easily confirmed if you would just do some research on your own, then what other crimes is your government guilty of? Let me ask you something. If you were walking down the street and were accosted by a robber, would you ask the robber if he was a Democrat or a Republican, and then surrender your money to him just because he belonged to the same political party you did? Then why in God’s name do you support your government’s continued violations of the Constitution and your rights simply because your party happens to control it? This corruption that people today refer to as the Deep State, or the Swamp, began to work its way into our system of government the moment it went into operation in 1789. It was under the policies established by Alexander Hamilton, then enacted by President George Washington which say our limited form of government, with a few specific powers, begin to transform itself into this monstrosity with almost unlimited authority. This did not occur suddenly in one generation; rather it was a slow and gradual erosion of the principles the people of this country believed in. In 1788 James Madison told the Virginia Ratifying Assembly, “I believe there are more instances of the abridgment of the freedom of the people by gradual and silent encroachments of those in power than by violent and sudden usurpations.” That is exactly what has happened too; the erosion of our liberty began in 1789 when your government first went into effect, and it has continued unabated until you have very little liberty left. 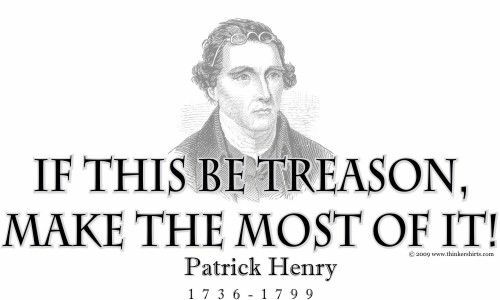 Patrick Henry tried to warn people of the dangers this system of government would lead to when he said, “Here is a revolution as radical as that which separated us from Great Britain. It is radical in this transition; our rights and privileges are endangered, and the sovereignty of the states will be relinquished: And cannot we plainly see that this is actually the case?” Yet the people would not listen, the allure of a great and mighty American Empire was too strong, or the fear that should they not ratify the Constitution the Union would split asunder was too strong. The result was that they ignored Henry’s dire warnings and adopted this system of government; and the rest, as they say, is history. Before I close there are two other things I would like to say. First of all, liberty is not the property of the government to control and restrict at their leisure or will; it is yours. However, if you want it, if you cherish it, you are shouldered with the burden of defending it from whomever might threaten to restrict it; and this is true regardless of which political party they belong to. If liberty means anything to you then how can you justify your continued voting for candidates who, once elected, seek to undermine and restrict it? It’s a simple question, but one which all those who consider themselves politically active should be asking themselves. My final thought is this. I have come to the conclusion that the state of affairs in this country was all but inevitable once the Founders chose to accept this system of government. Even Ben Franklin warned that it would become despotic when the people became corrupted and needed despotic government to rule over them. Now when I say corrupted what I mean is that the principles which led our Founders to seek their independence no longer beat in the heart of every American, then the founding principles themselves will have been corrupted; not the morals or virtue of the people. You can call that treason if you will, but it only shows me that you ignore the treason being committed on an almost daily basis by your government when it no longer adheres to the purposes for which it was established. If you wish to remain blind and ignorant to the truths I have just laid bare before you, go ahead. Just don’t expect me to live in the darkness of ignorance, apathy, and blind loyalty to a system of government that enslaves you.